Kalpitiya is about 165 KM from the Capital City Colombo . Predominantly Muslim fishing community strategically located at the mouth of the Puttalam Lagoon, the town was a famous port in the late middle ages of Sri Lankan history. The sea with white beaches and coral reefs. 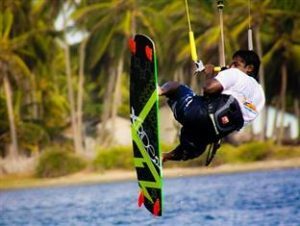 Learn Kite surfing from one of the best instructors in the island now from both the Kalpitiya and Puttalam lagoon. 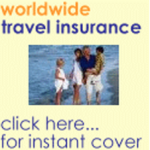 Scuba diving and seasonal dolphin whale watching are also on offer. Kalpitiya Beach is one of those rare places in the world where these most amazing creatures of the sea can be observed. There are many dolphins play and dance off the shore with daily. Water sports on offer include kite surfing. 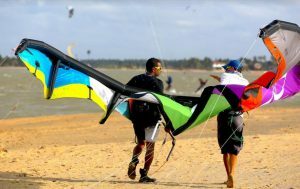 Kalpitiya beach is considered one of the Sri Lankan’s top kite surfing destinations. Advanced riders can take good experience at Kalpitiya Beach too. Close to Kalpitiya there are several largish islands that can be visited by boat. Kalpitiya is one of the fastest developing towns. There are also many international aid agencies such as the UNHCR implementing various community development and relief activates in order to provide assistance to these displaced living in this area. 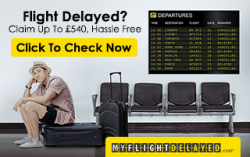 You can pre-order inexpensive taxi transfer to the city centre or to the airport. Comfortable car transfer for the family with children. Economy minivan for a tourist group or a Luxury transfer. The transfer cost is fixed at the time of pre-order and never rises. Either when the driver is waiting for the passenger, when the stop is necessary, or because of traffic jams.